A World War II-era plane that once searched for enemy submarines is flying again. 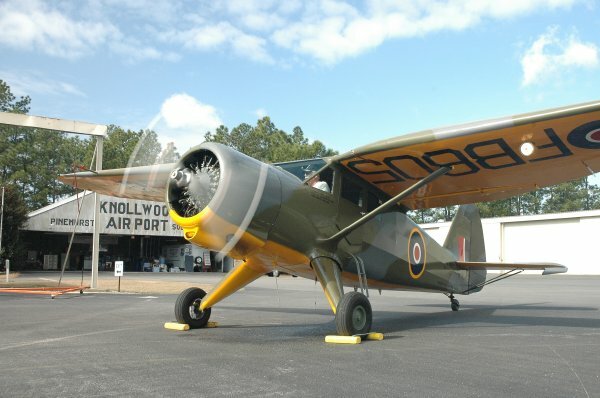 Royal Navy 605, a Stinson AT-19 derivative of the company’s Reliant monoplane, is based at Moore County Airport near Southern Pines, N.C., and is flown by the Carolinas Wing of the Commemorative Air Force. The gullwing airplane originally was built in Detroit but was sent to Great Britain under the Lend-Lease program. The plane will be on display Saturday during the wing’s open house from 11 a.m. to 3 p.m. at the airport. The Carolinas Wing is one of the oldest wings in the Commemorative Air Force, a volunteer, nonprofit group that honors American military aviation history by maintaining a “flying museum” of classic military aircraft. Steve Brown, the CAF’s president and CEO, is scheduled to be at Saturday’s open house. For the complete story by Steve DeVane of The Fayetteville (N.C.) Observer, click here.